just a sketchy animation i put together for a friend's birthday...i'd like to do something cleaner, and give yoshimitsu some more airtime, but i don't have access to the audio files for his (tekken) quotes- and this is the only place that seems to have them- though under lock and key. i don't really want to wait a year to have the requisite number of posts to get access, so i'll do you guys here at manjikai a deal. 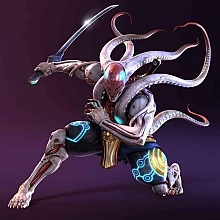 if someone who has access to the yoshimitsu audio emails all the files to me at rexsmealart@gmail.com, i'll start work on a yoshimitsu vs kunimitsu animation- with the manjikai website promoted in the animation. not sketchy like this one, a clean animation. i can't say fairer than that. what do you think? I absolutely don't know where to search, but I'll look into this matter for you. Btw, you're absolutely godlike for adding jin, mugen and Spike! Hmm, I have some of them (Angelboy, try this link). I'm not sure it's what you're wanting though, because you want sound effects right? These are just voice clips of various things he says in the game, I keep meaning to set my text alert to 'Jigajisan' like it used to be, but I keep forgetting. Must do that tomorrow. Oh oh oh oh.. and also.. about 暗送秋波, (ansoushuuha, although to me). I know Tenshi only likes to take the word of a native Japanese fan (and rightly so, for the sake of accuracy, although you still then have the loss in translation INTO English), and of course, my Japanese is scetchy at best, but.. I DO have plenty of dictionaries and a book of idioms and I am quite sure that a better translation than 'to fawn upon' (which is rarely used in English) would be, 'to flirtatiously glance'. 暗送秋波 is.. a sneaky glance to catch someone's eye. Think of the geisha, catching a man's eye while she pours his tea, hinting at her interest in him and keeping his attention. That is 暗送秋波. I guess it could also be, like when you look at someone with love-hearts in your eyes, but you'd need to check with a native speaker, it's too specific for me ^^. 'To fawn on' kinda means the same thing but even native English speakers would struggle to grasp the meaning from this. Why yoshi says this is a mystery (though he clearly says it ironically). I just got done watching it! LOL! It was awesome! thanks everyone, i don't get to work loose and sketchy like that often, so it was a lot of fun to make. @jembru- dang. so noone has the sounds? i guess you can't give me something you don't have...the deal stands, i'll trade a few hours of my time animating for all the yoshimitsu sound resources you have on file. Okay, I can send them, but I personally can't stand Kunimitsu so please, don't feel you need to make that animation for ME. Although I am sure there are plenty here who would really appreciate it. I ask for only two things in return; one is that you ask Tenshimitsu's permission first as these are her property and no one else has the right to share them, and two, if you DO use them, please write that they are from this site and add a link back to us. Oh and please don't share them publically. Let me know how you get on, hope you manage to get the files soon. We're not deliberatley being awkward, we'd LOVE new yoshi vids (which we can lock up in our volts too ^^). It's just like I say, the files belong to Tenshi and are Yot Memeber only for a reason. hold on, this is audio from the game we're talking about here, right? not fan audio? It is from the game, genuine audio, yes. The 'fan' part is the effort they went to to record it and add the translations. So fan created in that sense, but from the game. well, i've asked permission. now we play the waiting game. while we're waiting, who would you rather see yoshi go toe to toe with? bryan? It's a very nice animation What program do you use to create it? Can't wait for Yoshi. I've sent you a PM with info about the location of various audio files. I can't decide who to team Yoshi with... Raven? wow. i had figured someone had just ripped the content and it'd be just dumped in a folder somewhere, naked- but this is really in depth. a lot of love's gone into putting all this information together, it's a real pity that it's not more public. animated in flash- though when it's that sketchy, it could have been anything. and of course, you're welcome to host the animation here- i might even work in some kind of special extra so you have another little manjikai exclusive to lock away! i have to finish some paid work before i can start on this yoshimitsu animation- and i'm still shakey on who would be the best character for his opponent. i guess his main beefs are with kunimitsu, bryan, raven and heihachi. i'm a tekken guy, so you'll forgive me if i'm ignoring any SC related feuds he has. should i put up a poll in the general forum? Sure, you can make a separate topic as for character choice... I'm not sure whether you can make polls in these forums, probably not (yet) (this functionality will be in next version of this site).